How-to use the SmugMug Be Social Feature to post Videos to WordPress…Well, sort of! 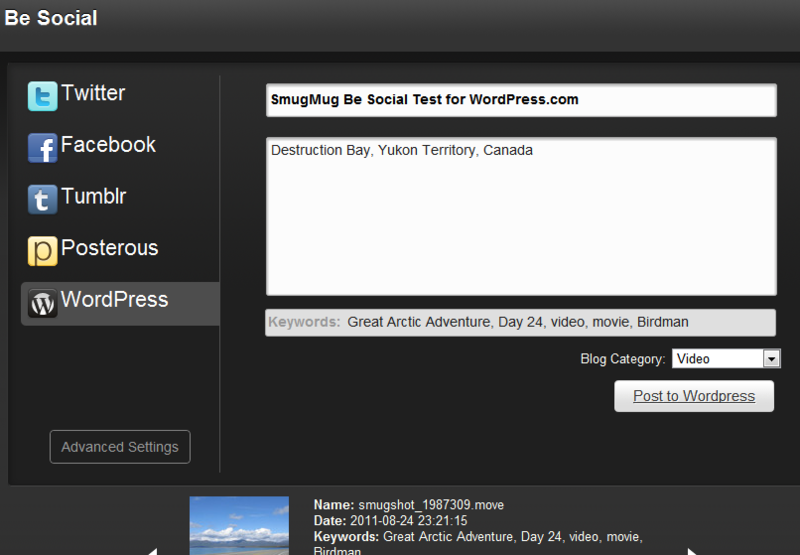 As you can see from the post, SmugMug Be Social Video Test for WordPress.com, only a “screenshot” image that links to a video in the SmugMug lightbox is available using the Be Social option in Smugmug. Not a surprise as SmugMug includes this Gotcha! in their Be Social documentation. Err..Never mind, I must have imagined this? At least, now you know! Anyways, your Caption and keywords (tags in WordPress) along with any other text you want to include, will also post to WordPress. Make sure the video (this works for images as well) you want to publish is selected as this will make it easier once you get to the next step. Click Share >> Be Social. The Be Social Pop-up will appear. Click on the WordPress Tab and sign in to your account. Next, you can change the post title and add any text you want to add. You also need to choose a Blog Category. Click Post to WordPress or go ahead to the next step for Advanced Settings. From Advanced Settings, you can choose the size and how you want your “screenshot” video image to align with your text. 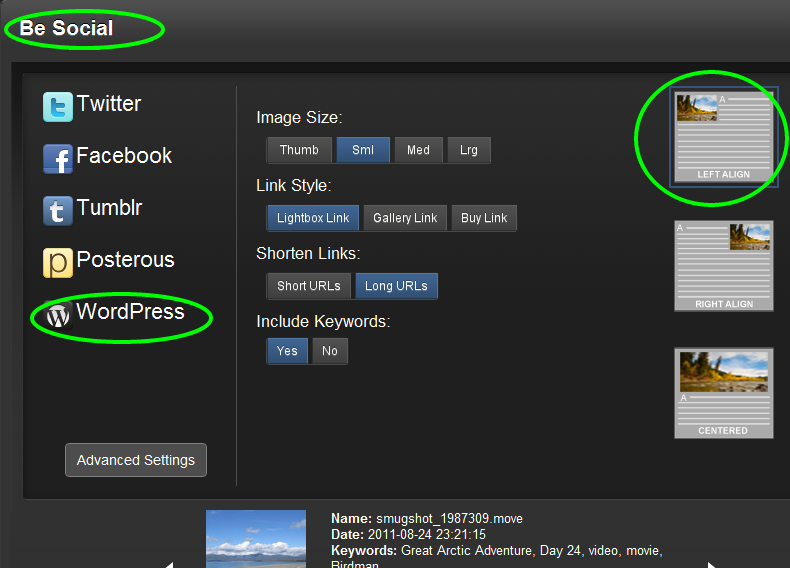 There are also link and keyword options as seen in the image below. You will then have to click the WordPress Button to get back to the previous screen and then click Post to WordPress. In a future post, I will show the code the Be Social feature uses and an easier way to do the EXACT same thing without so many steps. Posted by Foggyphils on September 1, 2011 in SmugMugHugs, Tutorials, Video and tagged Be Social, Posting Smugmug videos to WordPress, SmugMug, SmugMug Tutorial, Video Embed.